This cheery and peaceful old postcard has the German greeting Viel Glück im Neuen Jahre on the front. That translates simply to "Good luck in New Year." I think that's a sentiment that most of us can agree with, especially coming out of 2016. The back of the postcard contains an oval logo with the word "Amag" inside. That means, I believe, that it was published by Albrecht & Meister of Berlin, a company that produced postcards both before and after World War II. 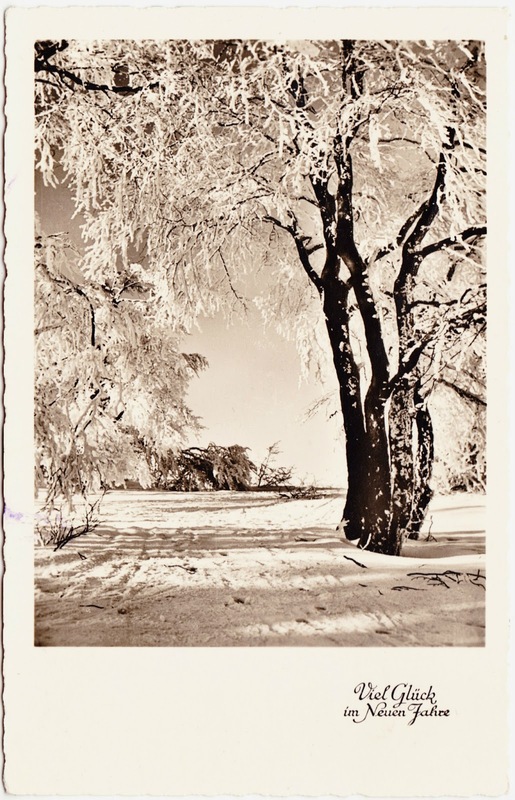 The card was postmarked on December 30, 1957, and sent to an address in Paris, France. The note is written in German cursive, which gives me an extra level of difficulty in trying to translate it. I started, but my first attempt resulted in the partial translation "we lick you," so I gave up. So much for that New Year's resolution to learn to read German cursive. Anywho, the other nifty thing about this 60-year-old postcard is the two stamps that were used. These stamps are from Switzerland, so that must be where the card was mailed from. Helvetia is a goddess who serves as the national personification of Switzerland, in roughly the same way that Uncle Sam does for the United States (but with a much longer, deeper history). Helvetia is used on coins, postage stamps and some official documents. These two stamps were part of a set focused on "technology and landscape" that was first issued on on August 1, 1949, according to www.stamp-collecting-world.com, where you can see the whole set. 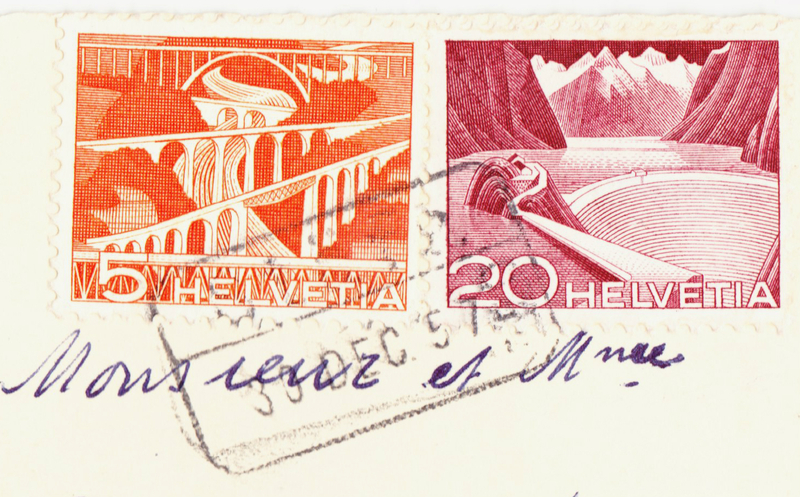 The orange stamp on the left shows the viaducts near St. Gallen, while the purple stamp on the right shows the reservoir at Grimsel Pass. There is a rarity version of the Grimsel Pass stamp, detailed by stamp-collecting-world.com, that is worth $4,000 in mint condition and $70 in good used condition. The stamp on this postcard is not the rarity.